Before I took the class I thought I might feel like the class would make me feel like I was being badgered or that I was not quite living up to my potential (the feeling I get from various self improvement—that’s an awful word!— or health/herbal/etc. books). That feeling almost scared me away from the class. I’m glad I took a brave leap and did it. For me, as an artist/writer this has been a great journey. I have greater insight into myself. I don’t really feel like I need to change or wish things were different. Well, maybe sometimes I do! Or maybe I can better say it this way – I don’t need to badger myself to relax, calm down, not get upset…or else… I can just be a friend to myself and listen the way a really good friend would listen. R.M. Wonderful instructors, caring, patient, kind. Show you the way, but you learn how to care for yourself. W.R. There is no cure all for the stress and anxiety of life. But this course has come close to the best foundation in my adult life for handling stress, anxiety, and self awareness. M.K. I wish all people had the opportunity to spend this time with Jean and Jane. L. D.
Make time for non-doing and the rest of time will follow with ease. P. R.
Stick with it and the practice starts to connect and put things together. T. P.
Even if you think you are coping well in life, there are many benefits to this instruction and its application. C.
How great of an experience this workshop is! Great introduction to the concept of mindfulness. Very easy to understand and great exercises to help cultivate a mindfulness practice in daily living. Mindfulness starts with self compassion. We can’t be mindful with others until we are mindful with ourselves. I feel more connected. It has cemented my desire to create a daily practice. Very great info. Thank you! I loved the course; it exceeded all of my expectations. As a busy mother and teacher I have found that mindfulness has helped me in so many ways. I wasn’t expecting that result. E.
Truly a gift that must be experienced. T.E. I’m so happy that this course came to me and that I accepted. E.P. The course was life changing. Sorry I didn’t take this earlier. F. E.
Jean and Jane are compassionate and loving people who lovingly give their knowledge and help to class participants. T.G. Three things I liked about the course: the strength, wisdom and caring of Jane, Jean and the group-it was a safe space; the loving kindness meditation; tuning in/slowing down. S.D. I loved the shared silence with a group of people who were committed to the practice. M. C.
Mindfulness is a gift that I was privileged to discover. J.P.
Changes in my life? Absolutely, in every regard. Noticed the world is a beautiful place. That society in general is hurried and scary at times. That colors are more vivid. That objects look more sharp. J.P.
At the beginning I had no preconceived notions. Didn’t quite know what to expect. But in the end I am profoundly pleased and changed in a fantastic way. J.P. This course has started me on a journey that I will continue for the rest of my life. A. Y.
Jane and Jean are very knowledgeable and both have great energy. I’m so glad to have joined the workshop. They both made me feel comfortable from the start. Jane and Jean are very soothing and create an atmosphere of acceptance and simplicity that make it easy to learn. What a wonderful introduction to something I have been very curious about, but did not pursue until now. By the end I felt calmer and hopeful that I have a few new tools to work with. Jane and Jean are so informative and pleasant to work with. Very enlightening practice. Opened my thinking about my perceptions and reality–choices. A great way to become more aware of why and how to deal with personal reactions to different situations. Such an important reminder to return to the moment throughout my busy days. The workshop was an invaluable gift to myself. I know the remembrance of what we were able to practice/learn will help me at just the right times and bring greater enjoyment to my life (and the holiday season). M.C. The workshop afforded a time to pause and reflect in the moment and served as a reminder to do that at the busiest, most stressful time of the year. A. A. The workshop was inspirational and eye opening in how one can care for themselves during the holidays. B.C. It was much more in depth and even better than I thought it would be! Halleluyeh! Great to relearn that my emotions come with sensations and thoughts that I can look at and not get consumed by. Being present, helpful to remember being present. Also really good and helpful to bring in movement, yoga, the permission to stand and meditate. You are a lovely team. Thank you for being you, Jane and Jean. I am so grateful to have found you. Humor is much appreciated and definitely one of the elixirs of life! A. H.
I don’t think there was any part of this workshop that did not work! I felt it went smoothly and powerfully. Seamless is the word that comes to mind. Experiential. You both led us through our own experience and in such a short time! I feel an openness and a shift in my thinking and feeling into the difficult situations I have been struggling with. Thank you! If you ever offer your own trainings for mindfulness teachers, I will be the first to sign up. I highly recommend Jean and Jane as among the best MBSR teachers I know. M.N. I find myself more centered in my day-to-day life. In general terms, I liked the atmosphere of calm, tolerance, interest and thoughtfulness that Jane and Jean established and maintained over the weeks of the course. I also appreciated the flexibility shown to accommodate our schedules. That showed a real concern for us and an emphasis on facilitating our learning. S. G.
I am more aware of patterns of upset and I can catch myself and breathe, tune into sensations, thoughts and emotions and I can come back to the breath sometimes. My relationship with my husband and my daughter is better, less anger on my part. Not all the time but more of the time! 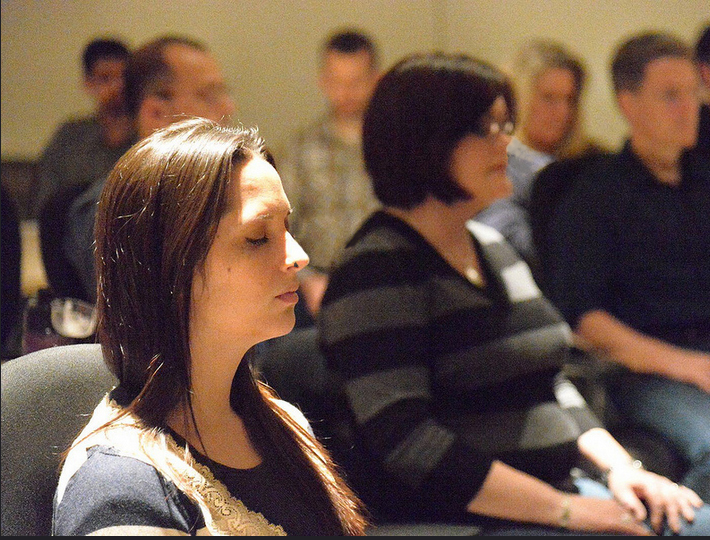 A. H.
It was a comprehensive, welcoming introduction to mindfulness offering a personalized approach. This was my very first experience with meditating for stress reduction and I feel quite prepared to continue the methods now. V. M.